There’s a large debate in the vintage community about whether we should wear vintage clothing or save it. It’s a tricky question. What most people consider vintage clothing– clothing 80-20 years old– was usually mass produced. It’s fun to wear older clothing because it’s made differently and fits differently than modern mass produced clothing– so many different shapes, colors, and fabrics to explore! Even hand-sewn items are abundant because of population boom, especially after WWII, so there were more people to clothe and printed patterns became cheap and easier to use. Wedding gowns are a favorite vintage item because they are often worn for only a day, then carefully preserved and passed down to the next generation. Little girls dream of one day wearing mommy’s or grandma’s dress to their wedding, and dresses from the 1930s to even the 1980s (yes, big, poofy sleeves coated in plastic pearls are coming back into vogue) are being re-worn by this generation’s brides or updated to suit modern tastes by shortening skirts, removing sleeves, or adding trims. Altering a wedding dress to suit changing fashion norms and different body types is a common practice that has been going on for ages. For previous generations, however, vintage clothing wasn’t mass produced. For our grandmothers and even our mothers, vintage clothing stretched back into the era of home sewing. Go back even further and everything was not only home-made but hand-stitched as well. The investment of time, labor, and materials was much greater, and dresses were picked apart and re-fashioned much more frequently to squeeze every last iota of usefulness out of the fabric. 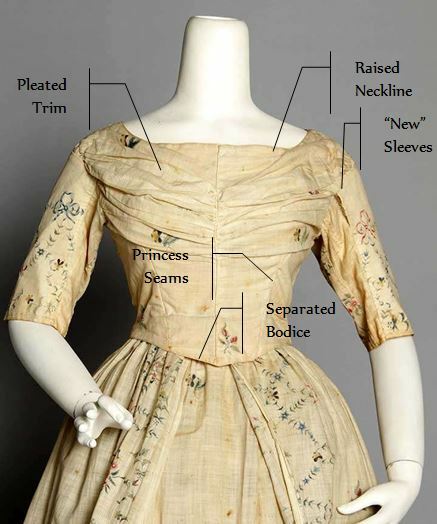 In the 1840s and 50s, 18th century inspired fabric designs were all the rage and women began turning to their grandmothers’ old-fashioned, outdated 18th century gowns into then-modern designs. 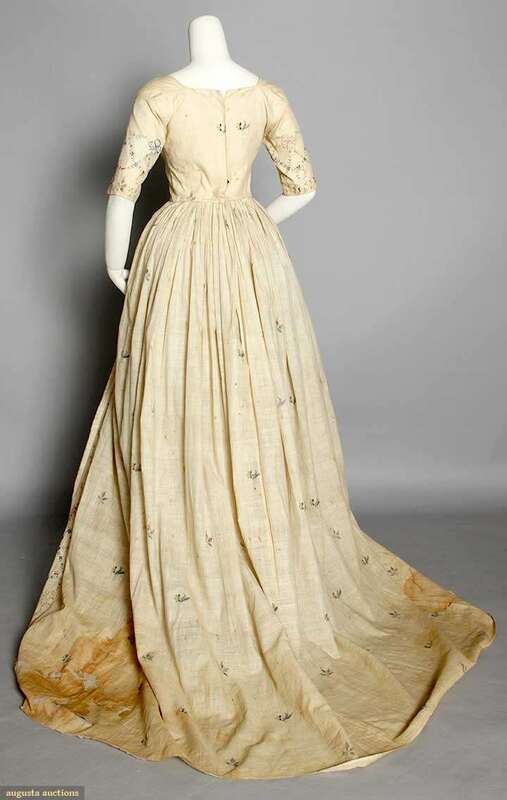 They list it as a 1795 Wedding Gown, but just looking at it tells you that something is off. The fabric is right, as is the petticoat-overdress styling, but everything else is off. Perhaps it’s just the lack of panniers or a bum roll to support the trailing overdress? 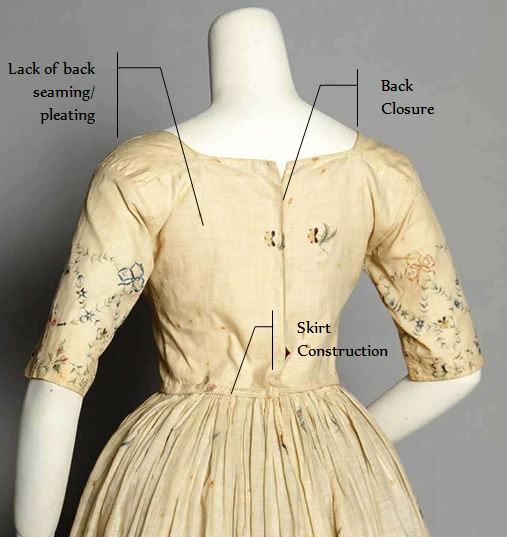 While the mannequin isn’t helping matters, it’s the pleated trimming at the bust, redone sleeves, back-closure, and waistline that are 100% 19th century. The biggest giveaway that this dress is a remodel is the bodice. 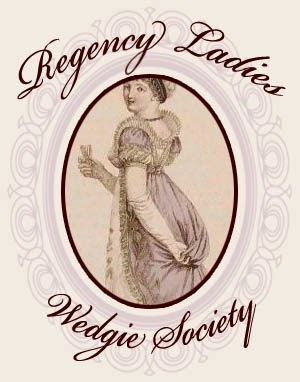 Indeed, it seams as though the Victorian seamstress might have turned the bodice backward! Everything about it screams late 1830s/early 1840s– from the wide, shallow neckline to the back closure (only children’s gowns in the 18th century closed in the back. 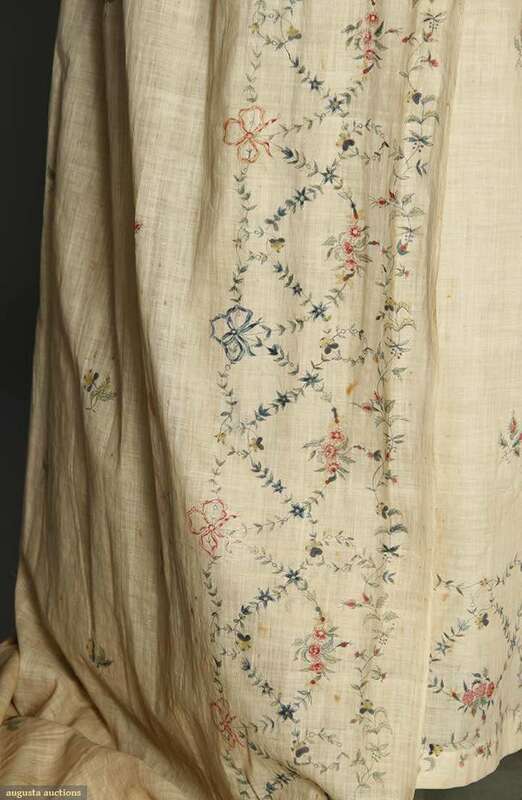 Women’s 18th century gowns closed in front). It’s hard to tell what the original gown my have looked like, but while it looks closer to a Robe à l’Anglaise now, judging by the large amount of fabric that went into the remodel, it’s possible it was a Robe à la Polonaise with the overskirt let down. 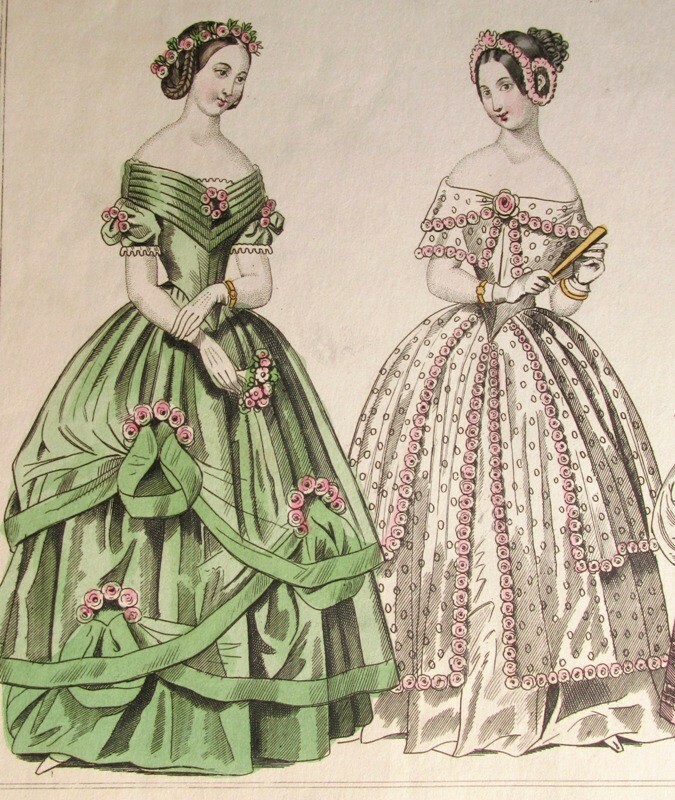 You’ll notice that the necklines in the fashion plate are much lower than on the Augusta Auction gown. The lady who remodeled the dress likely did so for her own nuptials since a low neckline would be considered very immodest for a church wedding. The sleeves of the dress and likely much of the fabric used to raise the neckline and make the pleated trim came from the petticoat. That would also explain the excessive staining on the overskirt of the dress. Luxurious trains never go out of style, so once the fullness of the petticoat had been lessened and rounded out, the overskirt was re-fashioned into an opulent bridal train. 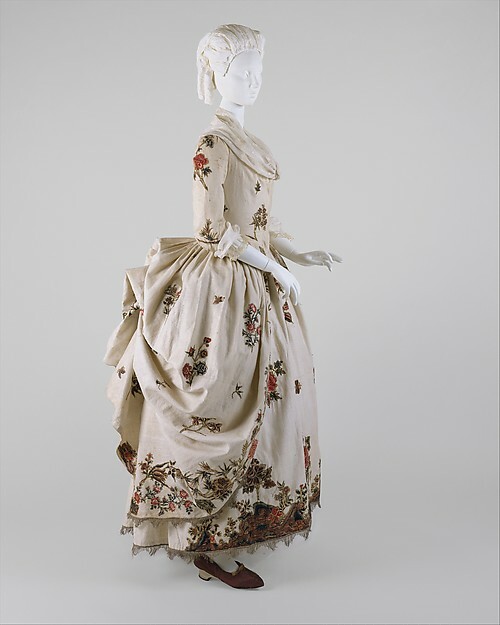 There are other dresses like this one that were made of 18th century fabric in the mid-19th century. Even Elizabethan and Stuart-era garments were not immune to the Victorians’ romantic obsession with ancestral fashion. It was a common practice, much like wearing vintage or sewing with antique textiles today. Every generation looks back and laughs at how ridiculous their parents and grandparents dress, but they also admire them as well. 19th century fashion writers are constantly complaining about the poor quality of their current fabric selection compared to the rich, sturdy fabrics of their predecessors (Doesn’t that sound familiar?). Just as costumers and vintage-wearers today turn to antique collars, yardage, and trims to get the look just right, so did our ancestors. For some, it’s a crime to destroy rare and precious garments in this way because it means there will be fewer preserved for future generations. 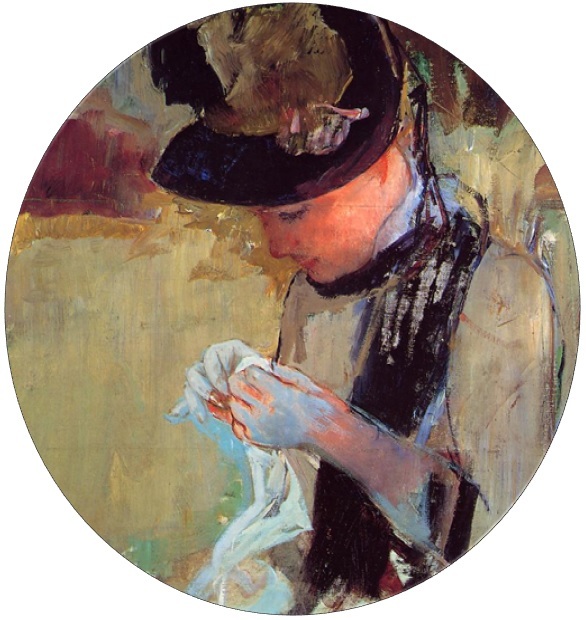 Others believe that garments are made to be used and enjoyed. Others, like myself, sit in the middle ground. There is a time to trash, a time to transform, and a time to treasure and it’s highly subjective. 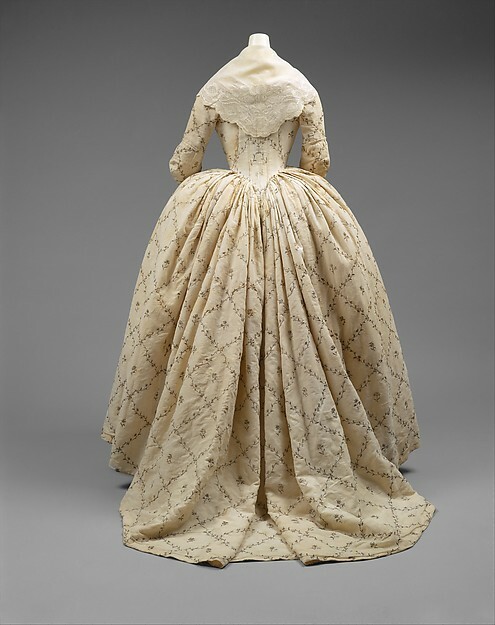 While it’s sad that we will never know what the 18th century incarnation of this gown looked like, it has a fascinating history that makes it unique among dresses. 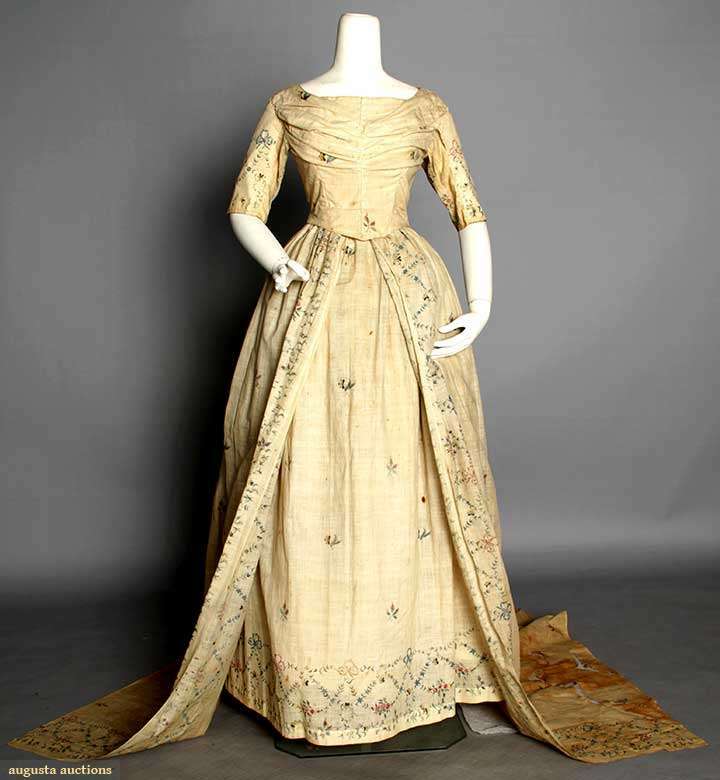 There are quite a few well-preserved 18th and 19th century dresses in museum collections around the world, but pieces like this are much more unusual!